Did you know that Barcelona's Baja Beach Club, a dance club at the Port Olímpic, is the only club of its kind whose VIP members are implanted with ID chips? The tiny microchips (each is about the size of a grain of rice) allow VIPS to enter and order drinks with a wave of the hand. Frightening, or the 'wave' of the future? This short travel video delves into the exciting Moroccan city of Marrakech. 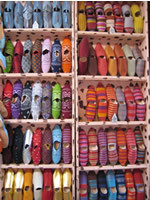 Click here to see Part I and Part II of "Adventures in Marrakech".